Every wood product that we sell is manufactured in Europe and complies fully to every required standard for sale in the UK. Safety - Varnishes in accordance with the latest standard EN 71-3:2013M Quality - Wood always sourced from FSC certified sustainable forests Standards - Execution in accordance with the latest standard EN 716:2013 COT-BED BEDDING FOR DISPLAY PURPOSE ONLY (NOT INCLUDED). All our cot beds are made in Europe and meet rigorous European safety standards (EN-716). 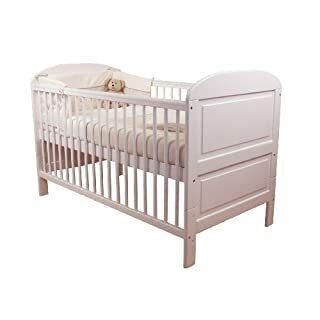 This classic contemporary cot bed is high quality solid construction made of natural pine wood. 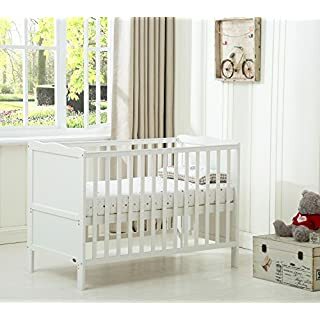 Three base height positions means you can have your newborn at the highest position for ease of lifting them in and out, and as your little one grows the base can be moved to the lower position to help prevent from climbing out. 6cm foam mattress with luxury aloe vera zip cover. The cover is antiallergenic and antibacterial. It has a leaf extract of aloe vera, which help blood circulation and are gentle to the delicate skin. Mattress complies with the British requirements BS 1877 -10:2011 + A1:2012. Unfortunately we ship this item to UK mainland only. We also do not ship to Highlands and Islands of Scotland. The Eva cot bed is designed with full of style and versatility, the classic curves compliant either traditional or contemporary scheme. The cot bed made of solid pine wood, it features every convenience function of modern cot bed. Single handed drop side mechanism, making it considerably easier for parents to reach their baby. Slat all round design for best visibility to checking the baby and improved ventilation for sleep. Full-width drawer on runner provide extra storage. 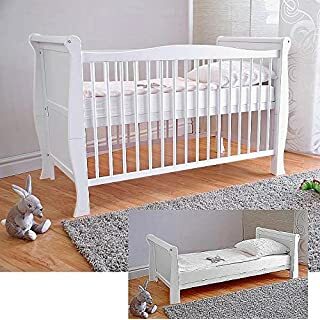 Protective teething rail on top of both sides, babies relish on chomping edge of a cot, with teething rail, protective cover side edge of the cot, you can avoid the risk of damage to baby's teeth and gums. 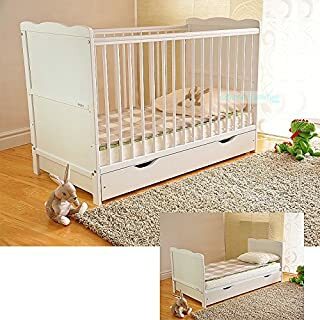 Three adjustable bed base positions that allowing you to alter the height of base to ensure safety as growth stages of the baby, for safe and security. 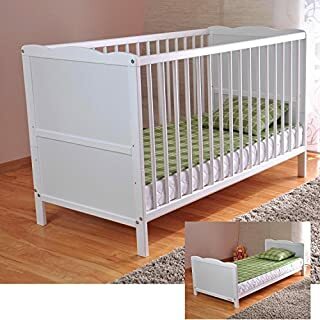 Easily convert to junior bed/sofa/day bed, not only cot last longer, but it help baby to move from cot to bed as smooth as possible. Suitable from birth to approximately four years old. UK standard cot mattress size - 120 x 60 cm. Meet British and European safety standards. Assembled size: L 137 x W 66 x H 100 cm. 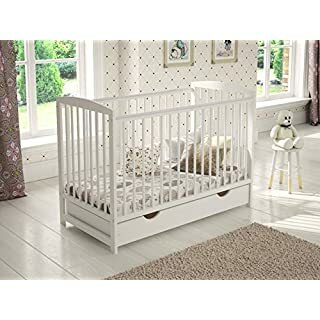 Babymore Deluxe Nursery Mattress, Professional made in UK, the design of mattress that ensure comfortable sleep of baby with excellent support and ventilation, which are the key factors for sound sleep. Our mattress are dent resistant, hypo-allergenic, water resistant, wipe clean surface, fully breathable and Zip cover washable at 60 degree. Firm mattress as used High Grade Density pad, it offer a lot more support and comfort, it will last throughout the years of use with your cot bed. Babymore mattress complies with the Rigorous Requirements of BS1877 and BS7177. When it comes to baby products, SAFETY is always our first concern. We have put the safety standard as our priority. All our Cotbeds & Toddler beds are made to meet and exceed latest EU standard BS 1877 Part 10 for safety and performance , BS 7177 and BSD5852 Part 1:1978. 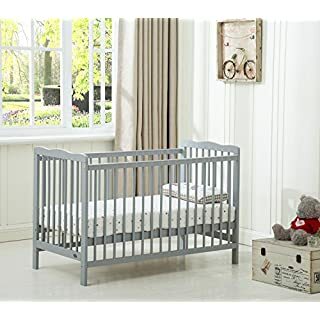 This cot (126*66 cm) is made from solid pine, featuring height adjustable base positions. Suitable from Birth to 5 years old. Our mattress is Made in UK in compliance with UK Health & Safety Standards: BS 1877:part 10:1997 BS 7177:2008 (low hazard domestic use). The mattress (120*60 cm) is covered by a breathable and water repellent, non-allergenic cover which is softly quilted for added comfort. The fabric is made from non-allergenic non-woven polyester. The open "cell" structure of mattress allows good airflow and helps promote heat dissipation. 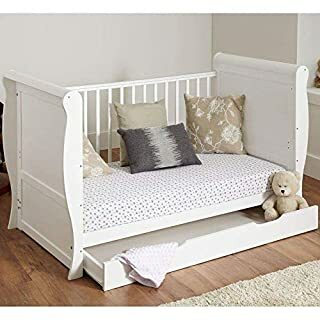 This is a quality cot bed made from solid pine, not the light weight version made with plywood. When it comes to baby product, SAFETY is always our first and major concern. We have put the safety standard as our priority. All our Cotbeds & Cribs are made to meet and exceed latest EU standard BS 1877 Part 10 for safety and performance , BS 7177 and BSD5852 Part 1:1978. 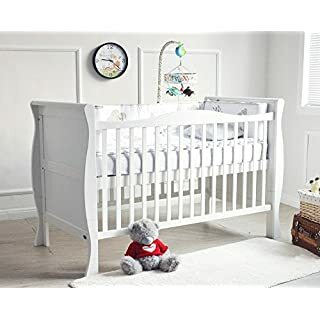 This spacious cot bed is made mainly from solid pine. 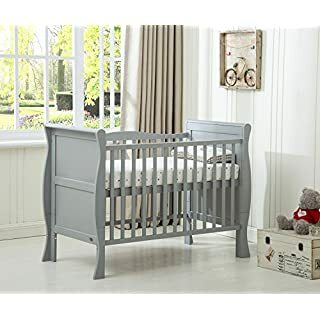 It can easily be converted to a junior bed by removing the side rails and dividing the foot end, featuring two adjustable base positions. Suitable from 18 months in the toddler bed mode. Our mattress is Made in UK in compliance with UK Health and Safety Standards: BS 1877:part 10:1997 BS 7177:2008 (low hazard domestic use). 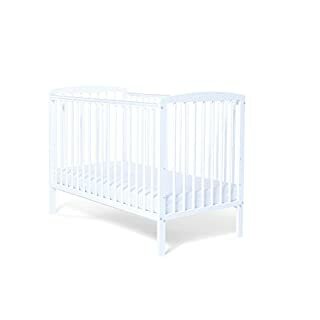 Please note the cot and mattress will be sent out together however they may be separated in the couriers depot which may result in the deliveries being split into 2 separate days. Please note we are currently unable to deliver to Channel Islands, Isle of Wight, Isle of Man, Scilly Isles, Scottish Highlands, Scottish Islands and Northern Ireland. When it comes to baby products, SAFETY is always our first concern. We have put the safety standard as our priority. All our Cotbeds & Toddler beds are made to meet and exceed latest EU standard BS 1877 Part 10 for safety and performance , BS 7177 and BSD5852 Part 1:1978. 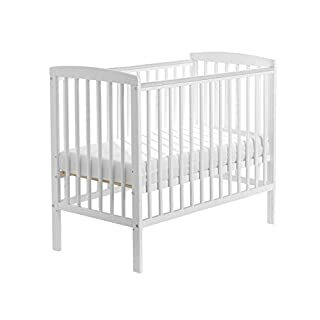 This cot (126*66 cm) is made from solid pine, featuring height adjustable base positions. Suitable from Birth to 5 years old. Our mattress is Made in UK in compliance with UK Health & Safety Standards: BS 1877:part 10:1997 BS 7177:2008 (low hazard domestic use) The mattress (120*60 cm) is covered by a breathable and water repellent, non-allergenic cover which is softly quilted for added comfort. The fabric is made from non-allergenic non-woven polyester. The mattress has foam core made from CMHR25 non-allergenic breathable foam which is free from antimony, phosphorus, and arsenic based fire retardant treatments and made with an 'Ozone' friendly formulation. The open "cell" foam structure of mattress allows good airflow and helps promote heat dissipation. Advice from The British Standards Institution (BSI): ✔ Choose a mattress that feels firm rather than soft, your baby needs support while sleeping. ✔ Check if it conforms to safety standards - mattresses should carry the BSI number BS 1877-10:1997. Mattresses that do not display a label are illegal and should not be sold in the UK. 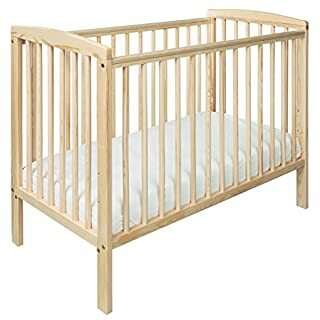 This is a quality cot bed made from solid pine, not the light weight version made with plywood. Please note we are currently unable to deliver to Channel Islands, Isle of Wight, Isle of Man, Scilly Isles, Scottish Highlands, Scottish Islands and Northern Ireland. 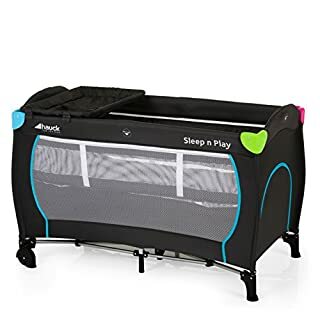 This great Sleep'n Play Center is just perfect for your holidays or avisit at grandma's and grandpa's. 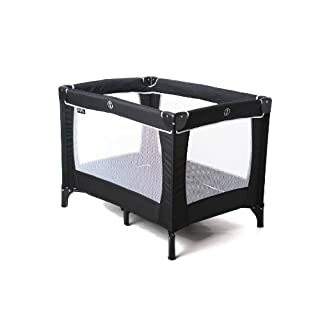 At home you can use the shapely travelcot as a practical second bed.With this Sleep'n Play Center you are perfectly equipped as everythingyou need for your baby is with you on your trips.On the practical changing mat, which can be fixed on the bed, you canswaddle your baby on the go easily. Thanks to the strap that allows youto buckle your child up and the raised edge, your child will lie safeand comfortable. If the changing pad is no longer needed, it is simplyhung on the side of the bed.On the second level, the elevated lying area, you can lay your newborndown to sleep. Here it is safe and secure. 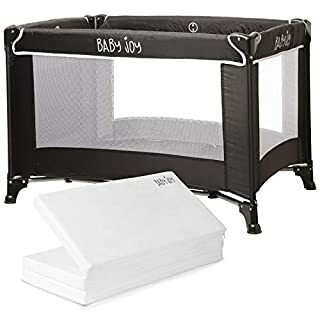 At the same time, you protectyour back when you want to lay your baby down or when you take it out ofthe bed.Your child can also play in its Sleep'n Play Center. 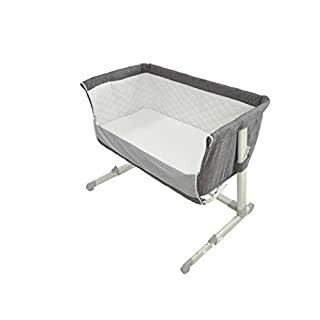 Here it is in safehands and you will always have an eye on your little one thanks to theviewing window.If you want to place the cot in another room, it can be moved aroundeasily thanks to its two rolls. 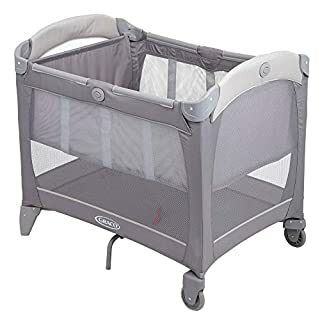 The Sleep'n Play Centre is built up orfolded up in only a few steps and can be stored space-savingly. On yourtrips, you can pull the bed like a suitcase behind you. Please note we are currently unable to deliver to Channel Islands, Isle of Wight, Isle of Man, Scilly Isles, Scottish Highlands, Scottish Islands and Northern Ireland. When it comes to baby products, SAFETY is always our first concern. We have put the safety standard as our priority. All our Cotbeds & Toddler beds are made to meet and exceed latest EU standard BS 1877 Part 10 for safety and performance , BS 7177 and BSD5852 Part 1:1978. The Brooklyn cot is crafted from solid pine wood. 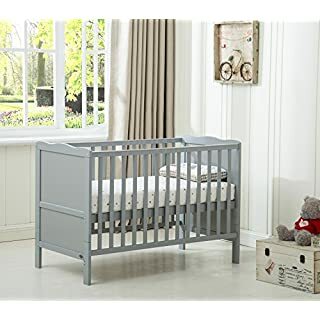 With its sturdy design and 3 position base, it's the perfect starter cot for your little one.Perfect for the modern nursery, the cot has smooth side rails, a classic design on the head and the option of 3 base height positions. It also comes with teething rails for essential added protection. Flat packed and easy to assemble, with tools included. 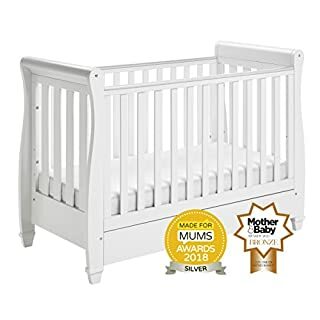 Suitable from birth up to 3 years, this cot will fit all nursery spaces.Our mattress is manufactured in the UK in compliance with UK Health & Safety Standards: BS 1877:part 10:1997 BS 7177:2008 (low hazard domestic use).This is a quality cot that is made from solid pine, not the light weight version made from plywood.